Founded in 1999 by physical education teacher and volleyball coach Joan Forge, Pass Set Crush is an outdoor adventure camp with a concentration in volleyball. The camp is available for girls entering the 7th through 9th grades. Pass Set Crush offers a variety of activities in addition to two daily sessions of volleyball skills training and games. This unique summer camp experience includes: swimming, canoeing, kayaking, water carnival, beach BBQ, Zumba, relaxation techniques, yoga, Pilates, low ropes course, and campfires with s’mores! 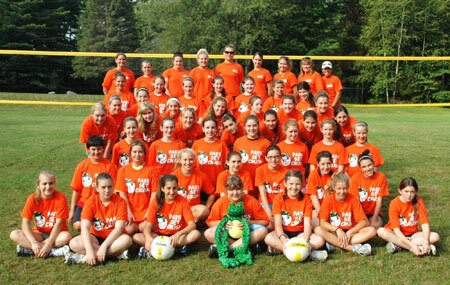 The camp takes place at Geneva Point Center, a 200-acre camp located on Lake Winnipesaukee in central New Hampshire. This special place offers beautiful views of the lake and the Ossipee Mountain range—the perfect spot for a summer camp experience. 2019 will be the 21st summer of Pass Set Crush Volleyball Camp at Geneva Point Center on Lake Winnipesaukee. This camp is available for girls entering the 7th - 9th grades in the Fall of 2019. Space is limited to 42 campers per session. Campers receive plenty of personal attention with our 4:1 camper to staff ratio. We are proud of our reputation and our fun and enthusiastic staff. Photos are taken every day during camp and are posted on our website each night for families and friends to view. Any photo can be downloaded for free. Check out our Scrapbook link and see what “a day in the life of a Pass Set Crush camper” is all about.